AAHA was founded in 1933 and is the only association that provides voluntary accredation to companion animal hospitals. We are one of approximately 3,000 veterinary hospitals in the United States and Canada that are AAHA-accredited and have made a commitment to meeting the highest standards of veterinary care. The AAHA Standards of Accreditation are widely used benchmarks to measure excellence in veterinary medicine. Our hospital has been successfully evaluated by an outside consultant on over 900 standards that directly correlate to the care we are providing your pet. The standards are periodically reviewed and updated to ensure they remain consistent with changes in veterinary medicine and technology. We set our standards high so that we can provide you and your pet(s) the highest quality of care and service. To be accredited by AAHA, our hospital must demonstrate an exceptional level of medical care and client service. AAHA's standards cover every aspect of our hospital to assure your satisfaction with the level of care both you and your pet receives. The standards require us to provide diagnostic services (x-ray and laboratory) so that we can quickly and accurately diagnose your pet. Not only that but because we have an onsite pharmacy (another standards area) we can begin treatment immediately. AAHA standards also require that medical records be thorough and complete which helps us better understand your pet's medical history and how past health issues might be impacting their current medical status. 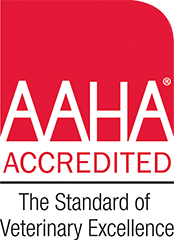 We are proud to be an AAHA-accredited practice and believe this helps keep us on the leading edge of veterinary medicine and helps us stay focused on continuous improvement to assure we can offer the quality and range of services you expect and deserve for your pet. AAHA-accredited hospitals are recognized among the finest in the industry, but more importantly we are dedicated to providing your pet with the best health care possible. For more information about pet health care or AAHA accreditation, feel free to ask a member of our team, or visit www.healthypet.com.